We get even closer to representing the urban-rural divide by displaying the results by county. 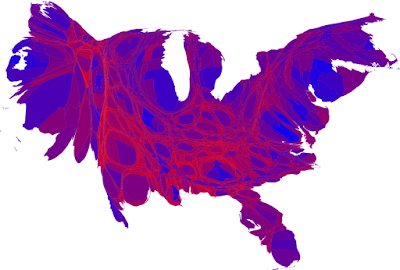 The first map is like the state map above, simple red and blue; the second is a cartogram, based on the population of the counties. For larger versions of these maps, and Newman's more detailed explanations, click here. Barack Obama shaved Republicans' advantage among rural voters, but his "bump in rural areas is nothing compared with his monumental gain in cities — a margin there of close to 13 million votes — up 10 percent from John Kerry's urban take. 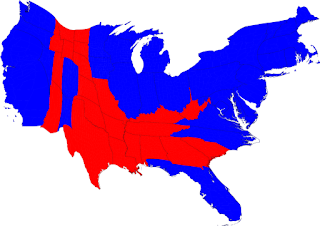 That makes the urban-rural political divide as big as ever," reports Howard Berkes of National Public Radio. Berkes draws from the analysis of the Daily Yonder, which The Rural Blog reported earlier this week. But he also cites Seth McKee of the University of South Florida, who studies the rural vote. "He blames the urban-rural political gap on race, especially in Southern states," Berkes reports. McKee told him, "It looks like some serious racial polarization going on." That was apparent in the votes of some heavily white counties in West Virginia, Kentucky, Tennessee, Arkansas and Oklahoma, which had been traditionally or marginally Democratic but turned Republican, as illustrated in a map that Matthew Yglesias adapted from The New York Times interactive county maps of current and historic voting patterns. The map also appears in the blog post linked to in the previous paragraph. 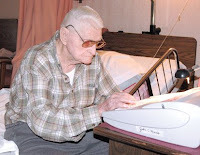 "Living in a nursing home, Morris wrote his column on an electric typewriter," the Times-News reported. "The typewriter had paper in it the evening he passed away, according to Sam Ford, a longtime friend and former employee of the Ohio County Messenger." The column, titled “Something to Think About,” ranged from religion to "his memories of the early 20th century and how much life had changed, Ford said." He was believed to be the oldest citizen in the Western Kentucky county of 23,000. Survivors include two sons, four daughters, a stepdaughter, 18 grandchildren, 31 great-grandchildren, 44 great-great-grandchildren and seven great-great-great-grandchildren. In Terrell, Tex., where about a third of the 13,600 residents are African Americans, there was considerable surprise and disappointment Wednesday when The Terrell Tribune, a daily newspaper with a circulation of about 1,900, carried no story on the election of the first black president of the United States. About 25 residents, who said they had hoped to save the local paper with Obama's victory noted front page, picketed the newspaper's office Thursday," reported Byron Harris of WFAA-TV in Dallas. "Protestors pointed out that on Election Day, the Tribune had printed a John McCain-focused story as their lead story on the front page." Publisher Bill Jordan, right, told Harris, "We run a newspaper, not a memory book service. We covered the local commissioner's race. We thought that was more important." Jordan declined to be interviewed on camera, and did not reply to a request from The Rural Blog for comment. Our search of the newspaper's Web site found no stories with the word "Obama." Another paper in Kaufman County, the 4,200-circulation Kaufman Herald, a weekly in the smaller, county-seat town of Kaufman, ran an 85-word, unbylined story on Obama's election, which noted that McCain got 67 percent of the vote in the county just east-southeast of Dallas. UPDATE, Nov. 9: The Daily Herald of Sapulpa, Okla., didn't report Obama's victory though "One paragraph on the front page did report the majority of Creek County voted for McCain," reports Krista Flasch of KJRH-TV. "More than a dozen protesters stood in front of the Herald's downtown office Friday morning to get answers from publisher Darren Sumner." Sumner agreed that the election was a big event, but said the 5,000-circulation, afternoon paper focuses on local news, and that's what readers expect. "I'm sure they read about it (the election) and watched it on TV, or got on the Internet and followed it, as many people did, and knew complete coverage before we were gonna go to press." (Read more) In 2000, Sapulpa was 3.8 percent black, 8,7 percent American Indian and 5.2 percent two or more races. Creek County's census had similar figures. Sales of guns and ammunition "have surged in the last week, according to gun store owners around the nation who describe a wave of buyers concerned that an Obama administration will curtail their right to bear arms," reports Kirk Johnson of The New York Times. "Every gun seller — not to mention every advocacy group for gun ownership that depends on dues-paying members — has an incentive to stoke the concern that can prompt a gun sale. Political uncertainty, gun dealers say, is great for business." Iowans pick Obama; how important was ethanol? Ethanol subsidies played a part in Barack Obama's victory in Iowa. While many say that John McCain's opposition to the subsidies hurt the candidate, it appears that it was just one issue that led to Obama's victory in the state. "John McCain used his long opposition to farm subsidies and ethanol incentives to burnish his credentials as a political maverick," writes Philip Brasher of The Des Moines Register. "Republicans say it hurt his campaign in agricultural counties that were key to President Bush's narrow victory in Iowa four years earlier." Ken Johnson, who raised the standards of daily journalism in Texas and then scored financial success as an owner of community newspapers, was buried yesterday in Dallas. He died Sunday at the age of 74. Johnson was best known as executive editor of the Dallas Times Herald, "which he transformed into a Pulitzer Prize-winning publication. The ensuing fierce competition between the Times Herald and The Dallas Morning News lifted journalistic standards across the region and state," wrote Joe Simnacher of the Morning News. Lenders representing a variety of agricultural portfolios will be at the Nov. 18 Farm Foundation Forum in Washington to discuss what the current credit crisis may mean to the agriculture and food industries. Presenters will be Joe Brasher of First State Bank of Sharon, Tenn.; Cornelius Gallagher of Bank of America; Paul Marsh of Prudential Agricultural Investments and Paul Ellinger of the University of Illinois. The forum will be held from 9 to 11 a.m. at the National Press Club, 529 14th Street NW. Coffee will be available at 8:30 a.m. Please RSVP by noon CST, Friday, Nov. 14, to Mary Thompson, Farm Foundation Director of Communications, mary@farmfoundation.org. There is no charge to participate. President-Elect Barack Obama and the next Congress will need to make significant decisions about schools, including the future of the federal No Child Left Behind Act. What impact will this week's elections have on schools? Discuss that at noon Eastern Time on Friday, in an Internet chat with with Education Week political reporters and Campaign K-12 bloggers Alyson Klein and Michele McNeil. Klein covers federal policy, as well as the states of Arkansas, Iowa, and Mississippi. McNeil covers state policy, as well as the states of Florida, Indiana, New York, Ohio, and South Carolina. For background, check out Education's Week's Campaign '08 stories, videos, and interactive resources. No special equipment other than Internet access is needed to participate in this text-based chat. A transcript will be posted shortly after the completion of the chat. "Rural counties and evangelical voters fueled by a pulpit campaign pushed Arkansas into adopting one of the nation's strictest bans on unmarried couples serving as foster or adoptive parents," The Associated Press reports. "The result surprised opponents, as Gov. Mike Beebe said he opposed the measure because of a lack of foster homes in the state. Arkansas Families First, a group that has been campaigning against the measure, launched a series of television advertisements urging voters to reject the ban," which was supported by literature from the Arkansas Family Council and sermons from pulpits. The state exit poll by Edison Media Research and Mitofsky International showed the initiative passed because of support from evangelical or born-again Christians. Among those who so identified themselves, 65 percent voted for the ban. Among those who didn't, 48 percent voted for it. The ban got 61 percent of the rural vote, which accounted for 44 percent of the exit-poll respondents. It got 57 percent in suburbs and 51 percent in urban areas. What does Obama mean for farm, rural issues? What will a Barack Obama presidency mean for agriculture and rural concerns? Agriculture Online reminds us of positions Obama took during his campaign, including: a $250,000 individual limit on farm-subsidy payments, and closing "loopholes that allow mega farms to get around the limits by subdividing their operations into multiple paper corporations;" a ban on meatpacker ownership of livestock; "meaningful local control" of pollution from concentrated animal feeding operations; promotion of organic agriculture and "regional food systems;" more help for beginning farmers; and more incentives for conservation. AG Online's rundown is drawn from Obama's Web site, which has a section devoted to rural issues. To view it, click here. California voters on Tuesday passed Proposition 2, which bans the confinement of egg-laying chickens, veal calves and pregnant pigs. Bob Burgdorfer of Reuters says this could have significant ramifications for the national egg industry. In California, egg producers see the costs of conforming their operations to the new law as an impossible hurdle. It is believed that the campaign against the confinement of livestock will eventually spread to other states. It seems unlikely that the Humane Society, which spearheaded the effort in California, will be content to only pass legislation in one state. "California often is a bellwether state, so it's likely this ban will be pushed in other states, said Bryan Black, president of the National Pork Producers Council. Burgdorfer reports the American Farm Bureau and the state's egg industry argue the law will increase costs to produce eggs, which likely will have consumers buying less expensive eggs shipped in from other states." While Proposition 2 limits caging of veal calves, California has little if any veal production. But its passage makes veal producers worry. Chip Lines, president of the American Veal Association told Reuters, "We certainly hope we don't see more of these measures on the ballot in other states, but the animal activists have a lot more money than the American veal farmer." Barack Obama won the presidency "by increasing Democratic margins in urban areas and by slightly decreasing the party's losses in rural and exurban areas" compared to 2004, Bill Bishop and Tim Murphy write for the Daily Yonder, following a state-by-state analysis of the vote. These results differ in some cases from exit polls, which ask voters whether they live in urban, suburban or rural communities, but the differences generally appear to be within or close to the polls' margins of error. For details, click here. At the moment, white rural voters are part of a shrunken Republican coalition "that may shrink with time," Alec MacGillis and Jon Cohen write in The Washington Post: "older, working-class and rural white voters, increasingly concentrated in the Deep South, the Great Plains and Appalachia." Retiring Rep. Tom Davis, whose Northern Virginia district elected a Democrat to succeed him, told the Post that as Republicans continue "to cater to their culturally conservative rural base, they continue to alienate educated voters." "But the shift is also explained by the transformation of many suburbs as they become more developed and cosmopolitan," MacGillis and Cohen write. "Bush prevailed in 2004 because he combined his rural base with just enough votes from the suburbs. But the Democrats have steadily been expanding from their urban base for the past decade. It is a shift that points to how the parties' basic messages have changed, with Republicans increasingly employing cultural themes that resonate most in rural areas -- such as Gov. Sarah Palin's appeals to 'pro-America' small towns -- while Democrats have focused on suburban concerns such as education." The phenomenon wasn't only Appalachian. 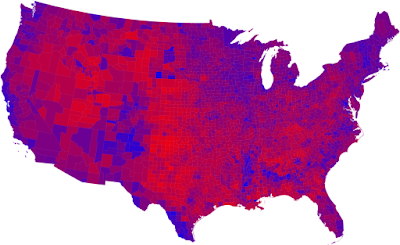 The map below, adapted from The New York Times by Matthew Yglesias at ThinkProgress.org, shows in red counties that were more Republican in 2008 than 2004. McCain did better in three states than Bush did in 2004: Tennessee, Arkansas and Louisiana. A new trend is emerging in agri-tourism, and is getting coverage in national news. The New York Times reports that "farm weddings" are a growing business in some rural areas. Mireya Navarro writes, "Weddings held at farms are not exactly new, but just as the wine craze decades ago sparked a vineyard wedding industry, the green crusade, with its emphasis on organic and local products, seems to be spurring interest in farms as the ideal venue for vows." The lower costs associated with farming venues, along with a more relaxed atmosphere, also make this an attractive option for some brides and grooms. On the farmers' side, it provides an additional source of income. A study by the Government Accountability Office found that of the 55,000 oil and natural gas leases issued by the Interior Department from 1987 to 1996, the majority expired without producing oil or gas. "Energy companies hold leases, but are not producing on, about 68 million federal acres -- property with the potential to double domestic oil production," reports The Associated Press. In response many in Congress are considering a "use it or lose it approach." Under that system, introduced by West Virginia Rep. Nick Rahall II supported by President-Elect Barack Obama, companies that leased land but did not drill would be barred from leasing in the future. The turmoil is caused by a combination of high corn prices, falling fuel costs and tightening loan opportunities. It began when summer floods drove up corn prices. Fearing a continued rise, many companies sought insurance by locking into a set price per bushel. As farms recovered, the cost of corn fell but many ethanol producers were locked into a higher price. Compounding the difficulties are the increased price of natural gas and the falling price of ethanol, which closely followse gasoline prices, and increased difficulty securing loans in the credit crunch. Rural broadband access might expand and get a whole lot cheaper, at least in flat country, thanks to a unanimous Federal Communications Commission decision yesterday. It authorized the use of unlicensed used of "white spaces" between frequencies that will be no longer be used after the switch to digital television in February 2009. Supporters say that will provide more powerful wireless service, and allow for the creation of broadband networks in areas previously considered not cost-effective. "The fossil fuels industry may face 'dark days ahead,' while alternative energy sectors are likely to flourish, because of the election of Barack Obama, Ian Talley writes for Dow Jones Newswires, quoting the outgoing president of the American Petroleum Institute. Coal interests also trembled, "concerned that Obama's pursuit of stringent greenhouse-gas laws could strangle the industry." Talley writes, "Although it will take years to engineer and implement, an Obama administration energy and environment policy marks a tectonic shift for the nation. He would move the U.S. away from petroleum as its primary energy source and towards renewable energy, advanced biofuels, efficiency and low greenhouse-gas-emitting technologies." Final-weekend reports about Obama saying his cap-and-trade plan would put new coal-fired power plants at the risk of bankruptcy appeared to hurt him in the Appalachian coal field, where his comment was misrepresented as bankrupting the coal industry. Keith Strange of The Coalfield Progress in Norton, Va., and The Post in Big Stone Gap reports. If Barack Obama has "an Appalachian problem," he mitigated but did not resolve it yesterday, according to county-by-county results and state-by-state exit polls for national news organizations. In Pennsylvania, on which John McCain counted to turn the race his way, he got 56 percent of the vote in rural areas and 57 percent in the largely rural central and northern parts of the state. Statewide, Obama got 55 percent of the total vote. 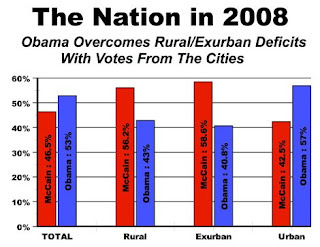 In Ohio, McCain got 53 percent of the rural vote in the poll; Obama carried the statewide returned 51-47. In West Virginia, where Obama made a late effort that was connected to his Ohio and Pennsylvania campaigns, McCain won the statewide vote 56-43 and the rural vote (54 percent of the respondents) in the exit poll 54-44. He did carry several coal-mining counties: McDowell, Boone, Braxton, Webster and Monongalia (home of West Virginia University). The only other county he carried was Jefferson, an exurb of Washington, D.C. In North Carolina, which has more rural voters than any other state, Obama was leading by 1 percentage point in the unofficial statewide vote, on his strength in urban areas. McCain got 57 percent of the rural vote in the exit poll, which accounted for 41 percent of the poll respondents. Obama carried three Appalachian counties: Buncombe (Asheville), Watauga (Boone) and Jackson (Sylva and Cullowhee, home of Western Carolina University) and a retirees' haven. In Kentucky, which neither candidate visited after the primary, McCain won the vote 58-41 and carried 64 percent of the exit poll's rural vote, which accounted for almost half of the poll respondents. Obama carried only eight of the state's 120 counties, three fewer than John Kerry. In Appalachia, he carried Elliott, one of the state's smallest and most staunchly Democratic counties; Rowan, home of Morehead State University; Menifee, a small county that is becoming a home for retirees; and adjoining Wolfe. The other Obama counties were Jefferson (Louisville), Fayette (Lexington), Henderson and Hancock. The latter two are in the Evansville TV market, which had ads from both candidates, as did all markets along the Ohio River. Some adjoining counties in Indiana went for Obama. Tennessee, which saw very few such local ads and was not contested, went for McCain 57-42. He got 61 percent of the exit-poll rural vote, which was 36 percent of respondents. Of the state's 95 counties, Obama carried six -- one of them Appalachian. That was Jackson on the Highland Rim, home county of the late Sen. Albert Gore Sr. He also carried Houston, near Nashville. The others have black populations ranging from 26 to 51 percent: Davidson (Nashville), Shelby (Memphis) and Memphis-area Hardeman and Haywood. Perhaps most significant was the result in Indiana, 80 years ago a hotbed of the Ku Klux Klan. It and Virginia hadn’t gone Democratic for president since 1964, but Virginia started turning blue on electoral maps a month ago. The election-eve consensus on Indiana was that McCain would carry it narrowly, but Obama turned it – perhaps with an Election Day visit. In the end, "McCain won many rural counties with 60 percent or more of the vote, but Obama offset that with big margins in many larger counties," report Mary Beth Schneider and Maureen Groppe in The Indianapolis Star. Overall, the exit poll gave McCain 55 percent of the rural vote. In more northern states, with less history of racism, Obama carried rural voters: for example, 54 percent in Wisconsin, 2 points less than his statewide vote percentage. He "built an organization that reached out well beyond the traditional Democratic urban bases into rural towns and villages, including rural Marathon County," which includes Wausau, noted Robert Mentzner of the Wausau Daily Herald. "That outreach appeared to pay off, as Obama carried many of those municipalities. In Minnestota, he won the rural vote 50-48, according to the exit poll. UPDATE: John McCain won 53 percent of America's rural vote in the presidential election, according to exit polls taken for national news organizations. Among voters in households where someone owns a gun, he won 62 percent; among those who have served in the military, 54 percent. Rural areas provide a disproportionate share of military recruits. Pre-election polls indicated that the rural vote would probably not go as strongly for McCain as he needed, based on pre-election polls. In battleground states, where both candidates were advertising and campaigning, a poll taken Oct. 1-21 -- a time exposure, not a snapshot -- showed Obama leading among rural voters 46 percent to 45 percent. A September poll in the same states showed McCain with a rural lead of 10 points. A GfK poll for The Associated Press Oct. 16-20 found McCain leading among rural voters by 18 percentage points, but that poll ran counter to other surveys at the time, as it showed Barack Obama leading only by 1 percentage point, 44 to 43. McCain's margin in the survey approached the 20 percent margin President Bush enjoyed over John Kerry in 2004. "The 2004 race was starkly divided between rural and urban," Bill Bishop and Tim Murphy write in the Daily Yonder. "Kerry carried urban counties by 3.75 million votes," but Bush "won the nation's 2,049 rural counties by 4.1 million votes and exurban counties by 2.56 million." The Yonder's exurban counties are those that are in metropolitan statistical areas but have a high percentage of residents living outside cities. For its methodology, click here. Rural counties had 17.4 percent of the nation's voters in 2004. The Yonder counts 530 exurban counties that in 2004 accounted for 9.2 percent of the vote. The 562 urban counties had 73.4 percent. That last figure includes many voters typically identified as suburban. "Bush won 61 percent of the exurban vote nationally and 59.2 percent of the rural vote," Bishop and Murphy report. "Kerry won 51.6 percent of the vote in the nation's urban counties." For the Yonder's report, which includes a state-by-state chart of the vote by category, click here. "Many in the audience wondered why Palin was spending time in a state where [Barack] Obama has a double-digit lead and speculated that she could be trying to drum up support for her own run for the White House in 2012," Agence France-Presse reported. "Iowa is traditionally viewed as the kick-off presidential state with its first-in-the-nation nominating caucuses. The largely rural state gave Obama his first win in the Democratic nomination process and some have credited that win with building the momentum he needed to ultimately beat Hillary Clinton. 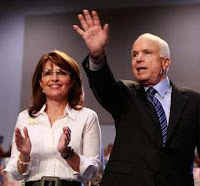 Spokespeople for McCain and Palin have denied that she's eyeing a 2012 run for president, saying she made the Iowa appearance because they believe the race is much tighter than what some polls show." Significantly fewer snowmobiles will be allowed in Yellowstone National Park next year. The new plan announced Monday will cut the number by 40 percent. Initially, park officials had sought to establish the number of snowmobiles allowed in the park on any given day to 605. That plan was rejected by a federal judge, who agreed "with environmental groups that filed suit that it would increase air pollution, disturb wildlife and cause too much noise," The Associated Press reports. "Last year, an average of 294 snowmobiles a day entered Yellowstone. But the peak daily use was much higher: 557 one day last December," AP reports. "More than 200 snowmobiles would have been turned back that day if the latest proposal was in effect." Jack Welch, a member of the Blue Ribbon Coalition, a snowmobile advocacy group, told AP, “People will be turned away, and consequently it’s not fair. Three-hundred and eighteen, no matter how it’s divided up, is not going to be adequate to allow for people to visit their national parks." The focus on geothermal energy production is focused in the western states. Adds Dickerson, "In October, the Bureau of Land Management said it planned to open more than 190 million acres of federal land in California and 11 other Western states for new geothermal development." Geothermal plants produce energy by tapping reservoirs "of scalding water and steam trapped thousands of feet underground, drilling wells to bring the heat to the surface to power turbines that feed electricity generator," adds Dickerson. These projects have two big supporters in Warren Buffet and Google Inc., both contributing sizable amounts of money. But still the money invested into the geothermal energy is significantly less than both wind and solar. But increasingly geothermal is being looked at as a more stable and consistent source of renewable energy. "Costing about 4 to 7 cents a kilowatt-hour geothermal is competitive with wind power and significantly cheaper than solar," Mark Taylor, a geothermal analyst with the consulting firm New Energy Finance, told Dickerson. "Geothermal facilities occupy a fraction of the space required by wind and solar farms. The energy is also more reliable. Plants crank electricity around the clock, irrespective of whether the sun is shining or the wind is blowing." Rural places should be able to build their local economies by drawing on pension funds in their regions, strategizing across economic sectors and creating organizations that are willing to take risks and mobilize capital, major speakers said last week at the Growing Local Economies Forum sponsored by the University of Kentucky's Appalachian Center. Economist Michael Shuman, author of The Small-Mart Revolution and researcher for the Business Alliance for Local Living Economies, told attendees that most investment dollars are not going to local business, which could generate more jobs "if they could get better financing, for instance from pension plans in their regions," the center said in a report. "He suggested that states 'tweak' their securities laws to allow local businesses to issue shares that investors could buy." “Communities that don’t make it are the ones with one economic sector as a strategy,” said Becky Anderson, a founder of western North Carolina’s HandMade in America, which "has strengthened its region’s crafts economy [by] connecting craftspeople with builders to providing automobile trail guides to artists’ studios and gardens," the center reports. In southwest Virginia and northeast Tennessee, former tobacco farmers have switched to organic crops and are selling them to supermarkets through Appalachian Harvest, a network of certified organic farmers that figures out what farmers should grow to meet grocers' and consumers' needs and provides a packing house and distribution system. Anthony Flaccavento, founder of Appalachian Harvest’s parent organization, Appalachian Sustainable Development, "said it is important to have an organization that is willing to take risks and mobilize capital," the center reports. The forum was held Oct. 29 in Hazard. For more information, contact Appalachian Center Director Evelyn Knight or Alison Davis, a Cooperative Extension economic development specialist at the university. The Environmental Protection Agency has finalized new rules for concentrated animal feeding operations, EPA said in a news release. This is the first time" EPA has required a nutrient management plan for manure to be submitted as part of a CAFO's Clean Water Act permit application," the release notes. CAFO operators are already required to follow such plans, but now will have to submit them with the permit applications, making the plan subject to public comment and perhaps better enforcement. "Manure contains the nutrients nitrogen and phosphorus, which, when not managed properly on agricultural land, can pollute nearby streams, lakes, and other waters," EPA notes. "The regulation also requires that an owner or operator of a CAFO that actually discharges to streams, lakes and other waters apply for a permit under the Clean Water Act. EPA is providing an opportunity for CAFO operators who do not discharge or propose to discharge to obtain certification as zero dischargers." The Natural Resources Defense Council calls that a loophole, reports Robert McClure of the Seattle Post-Intelligencer. The council also argued that CAFOs would be allowed to "avoid certain environmental enforcement," McClure writes. "For instance, if an operator certifies that the facility won't have a discharge, environmental authorities will ignore enforcement action, even if the facility discharges to the nation's waters." NRDC also complained that the rule "rejects improvements in technology that would reduce harmful bacteria and other pathogens contained in animal waste, missing an opportunity to prevent water pollution and threats to public health," McClure reports. Hog producers "applauded the new regulations," reports Ann Bagel Storck of MeatingPlace.com. (Read more) For a map showing state-by-state concentrations of factory farms and animals, from Food & Water Watch, click here. The Federal Communications Commission will not vote as scheduled tomorrow on proposed changes that could raise rural telephone rates to pay for greater broadband access, North Dakota Sen. Byron Dorgan told KCND-FM. The vote "has been pushed back until sometime in December," The Associated Press reports. The FCC appeared to be responding to congressional and interest-group requests; "37 senators and 79 members of the House of Representatives have now sent letters urging the FCC to slow down, open its plan to the public, and postpone" the vote, according to a press release from groups opposing the plan. They include AARP, the Consumer Federation of America, Consumers Union, the American Farm Bureau Federation, the Rural Telecommunications Alliance, the Communications Workers of America, state regulators represented by the National Association of Regulatory Utility Commissioners and the National Governors Association. For more background, read this report from the Business Technology blog of The Wall Street Journal or our Oct. 15 blog post here. The 620,000-acre Jack Morrow Hills region in southwest Wyoming is again at the center of the state's debate over oil and natural gas leasing. On Dec. 2 the Bureau of Land Management is planning a competitive lease sale for that area. The sale is meeting strong opposition from environmental groups as well as hunting and fishing advocates. Public lands around the Little Mountain area are also being included in the sale. A new law designed to boost sales of domestic meat may shake up the meat industry. The law will require meatpackers to slaughter cattle and hogs born outside the U.S. separately from domestic animals. At least one major meatpacker will stop slaughtering foreign-born animals, and producers may no longer find viable the practice of importing animals to raise and sell. Phillip Brasher of The Des Moines Register writes, "When the law first took effect Sept. 30, some major meatpackers planned to use multi-country labels on beef and pork so that they wouldn't have to track and slaughter U.S.-born livestock separately from livestock born in Canada and Mexico." This practice was deemed to violate labeling laws and was abandoned. Consequently, "At least three packers — Tyson Foods, Cargill and JBS Swift — now will segregate cattle and hogs by country of birth. Smithfield Foods said it will stop slaughtering Canadian-born hogs altogether next year." "The candidate who once spoke repeatedly of the need to curb climate change now devotes his speeches to touting the need to boost oil and coal production, two of the biggest contributors to global warming, while campaigning in those coal-producing states," write Shailagh Murray, Juliet Eilperin and Robert Barnes of The Washington Post. Many in the Scranton crowd were "wearing white ball caps emblazoned with 'Clean Coal' on the front," reports Andrew Seder of the Times Leader in Wilkes-Barre. (Read more) For a rundown of the candidates' energy platforms, from Beth Wellington in the Daily Yonder, click here. For a report from Mark Niquette of the Columbus Dispatch, click here. In Marietta, Ohio, Palin paraphrased Obama: "He said that, sure, if the industry wants to build new coal-fired plants, then they can go ahead and try . . . but they can do it only in a way that will bankrupt the coal industry, and he's comfortable letting that happen." Palin referred to Obama's Jan. 17 interview with the Chronicle editorial board, in which he backed "a cap-and-trade system, under which polluters must buy credits to offset their emissions," reports the Los Angeles Times. UPDATES: Palin "has kept up her attack on Obama over the remark on the campaign’s final day, linking it to Obama’s 'bitter' comment also made in San Francisco during the Democratic primary," reports Andy Barr of Politico. "The Obama campaign has countered the attacks by saying that the comments were taken out of context and by pointing out the Democrat’s position on coal varies little from McCain’s." For a transcript of the pertinent part of the interview, from Tony Rutherford of HuntingtonNews.net in West Virginia, click here. "If Pennsylvania is close -- or if McCain pulls off an improbable upset there -- the reason is Sarah Palin, who has stormed the rural parts of that state," the Evans-Novak Political Report says tonight. Less than two days after telling USA Today that he was voting for Barack Obama, Montana rifle maker Dan Cooper was asked to step down from the company he founded. In a story published Oct. 28, Cooper told the national newspaper that the Iraq War and the increasing conservatism of the Republican Party are two reasons he supports the Democrat, though he usually votes Republican. Obama, he said, is also an attractive candidate because of "the retooling of America, which involves the building of middle-class jobs and helping American small business be competitive with those overseas." Cooper's views caused a backlash among many gun owners and advocates, who traditionally see the Democratic party as being "anti-gun." Almost immediately after the story was published, Cooper Firearms was flooded with calls, letters and calls for a boycott. By Wednesday night, the company had posted a note on its Web site saying, "Although we all believe everyone has a right to vote and donate as they see fit, it has become apparent that the fallout may affect more than just Mr. Cooper. It may also affect the employees and the shareholders of Cooper Firearms. The board of directors has asked Mr. Cooper to resign as president." Cooper resigned but received statements of support from Democratic Gov. Brian Schweitzer and Bob Ricker, executive director of the American Hunters and Shooters Association, which has endorsed Obama. Ricker said told Ken Dilanian, who wrote a follow-up story in the same paper, "It's a really McCarthyism at its worst." An important part of faith is the ability to worship with like-minded believers, but what happens when there are not many like-minded believers around? A story by Sheila Hagar in the Walla Walla Union-Bulletin highlights the challenges facing the small Jewish community in largely rural southeast Washington. Congregation Beth Israel, which has had as few as 10 families, now has about 40 families in the congregation. They have only had one full-time rabbi, who stayed for only 2 years. This has meant that the congregation must work to foster their religious practice. Noah Levitt, president of the congregation, told Hagar, "It's not unusual for Jews who move here from larger cities to be surprised to learn of the level self-reliance the local congregation needs. If they want a Jewish lifestyle, they will have to shape it, make it happen."